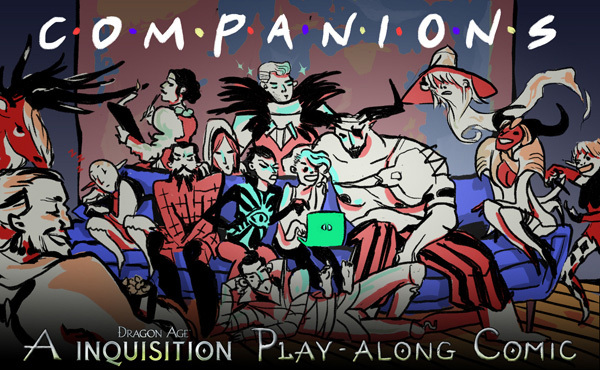 Coming next week, Companions is a new comic column by Jen Overstreet exploring the wonderful world of Dragon Age: Inquisition and Bioware romance adventures. Taking a pause in her deeply rewarding three-year relationship with Skyrim, Jen has embarked on a serious dalliance with “the game with the hot elves that Twitter keeps talking about.” While constantly willing to shout her pairing suggestions at TV, movies, and video games, she was previously unaware that action-adventure romance games were a thing and is now making up for lost time. With an autobio focus, Companions explores quirks of Bioware’s formula and gameplay, characters, and writing, as well as the personal gaming quirks of an idiot playing a one-person D&D campaign. Follow Jen as she refuses to accept game logic, takes great joy in playing in the most circuitous fashion possible, and plunges screaming into the uncanny valley. Relive the game or discover it for the first time. Wave a silent goodbye as Jen increasingly accepts Dragon Age: Inquisition’s characters as her Real Friends while IRL fades into a very nonmagical dream. Companions begins next Tuesday, and will update every two weeks. Illustrator, multimedia artist, musician, and magical girl. Will NOT stop talking about Sailor Moon, thank you.